The other night I was digging through a container and came across a bag of the brass keychain initials. From recall, I've been having them a good 5 or 6 years but have never used them ... other than giving an 'A' to Alex for his keys. (He must not have liked it as it disappeared rather quickly). The were looking a a bit tarnished and stressed, so dropped them into the tumber that contains the metal cleaning compound and ran overnight. The next morning, took them out and, wa-la, nice and shiny again. Later in the morning, stopped by Grans on my way to the gym and found this Yellow Necklace for $3.00. 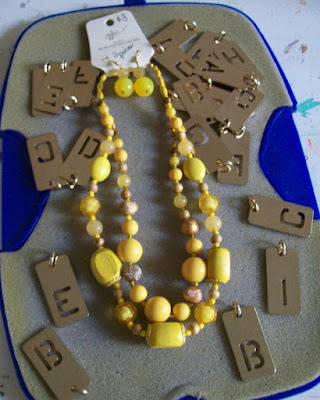 Decided it was a good buy as I don't have that many yellow beads and, it seems, to be a color I don't see that often ... either in stores or at yardsales. 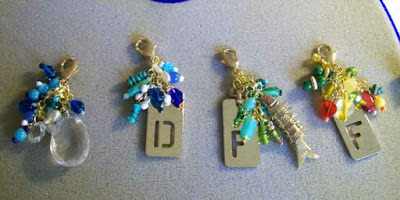 The brass letters and the beads were laying together on the workbench and decided it was time to do something with them. 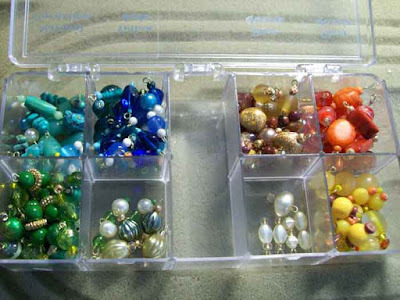 Soooo ... pulled out the findings container and a few of the bead inventory drawers and started putting together beadsets. And then a few more and then some more ... got a bit carried away ... but was listening to Tour de France and chatting with Beau and they simple multiplied. Put together 3 Pulls using the Brass Letters and then pulled made an additional Pull using the prism from the candlestick I picked up yesterday.